In a small village in the northern mountains of Lebanon some 60 years ago, a young girl made her father’s dinner for the first time. Her dish of choice was mujadara, and the caramelized onion and lentils did just what she’d hoped: they won her father’s praise. Nothing like a father’s adoration to get a daughter going, and to direct her in her life’s mission. 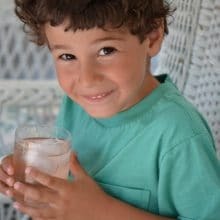 When I first was invited to write the introduction to the Lebanese cookbook that little girl would come to write in her late years, I hesitated. I polled friends. I tried to avoid the project. The idea of it, and the honor of the invitation, all of that puffed me up in the best possible way. 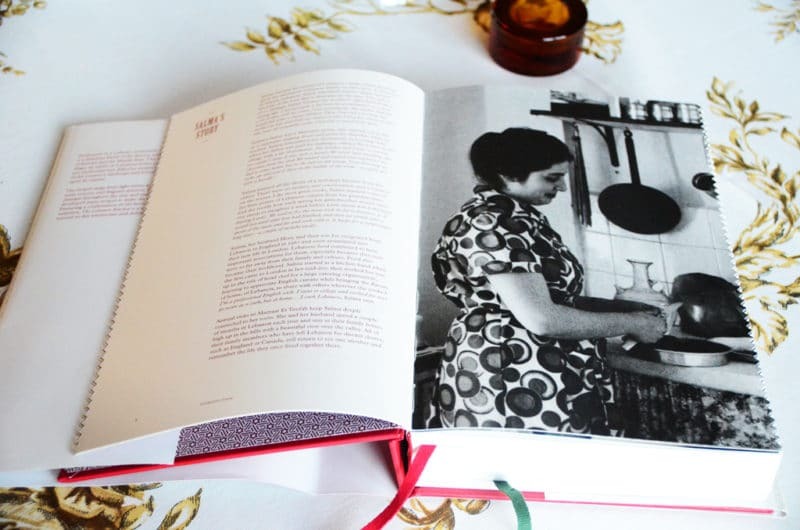 The publisher would be Phaidon, the granddaddy publisher of tome cookbooks out of London. They would actually pay me to do it (go figure). And the gem of the whole situation was that they had found me, here at Rose Water & Orange Blossoms, just a few months after I launched the site. Why hesitate then, Maureenie? It reaches back in time, as our hesitations often do, to 1992, and my Master’s program in literature at Michigan State. I had been writing long papers in the style of the critical theorists, piling their vocabulary into my brain on a daily basis, and planting myself in a corner to read for a good ten hours every day. Somehow writing an introduction for this massive, comprehensive cookbook gave me the distinct feeling I was back in grad school. I feared writer’s block, I wondered how I’d get it done in the short time frame they’d requested, and I imagined myself pulling all-nighters doing research in the MSU library only to produce a string of awkward sentences, all during the final layup to the deadline. Then, after I said yes to the opportunity, I settled in with pages and pages of interviews with Salma, the book’s author. Lo and behold, the woman came alive! I came alive! I was at the same time planning my first trip to Lebanon, so reading about her life growing up there was of endless fascination. There was no doubt a ton of information to assimilate, yet it felt…light. It felt like this work that I do now feels, which is not like work at all. It’s more like play. Sitting at the dining room table-turned-massive desk on Main Street, I broke down the project into bite-size pieces, and soon enough an introduction to which I could safely attach my name without regret was born (that name, though, is lost in wee print at the back of the book…). I feel as though I know Salma, and I was tempted to spend all of the money I made on the project to head to London, where she has lived and worked as a cook and family matriarch for many years, just to see her face and stand by her side in her kitchen. Her book is special. Beautiful, simple photos of Salma’s food jump out at you, and I so wish one had graced the cover. Recipes are both familiar and new. I christened the book by making Salma’s butternut squash with tahini sauce, a wonderful dish I’ve discovered is not atypical in the Middle East. No doubt this one won her father over, too. What an easy, yet sophisticated, side dish for our Thanksgiving feasts. 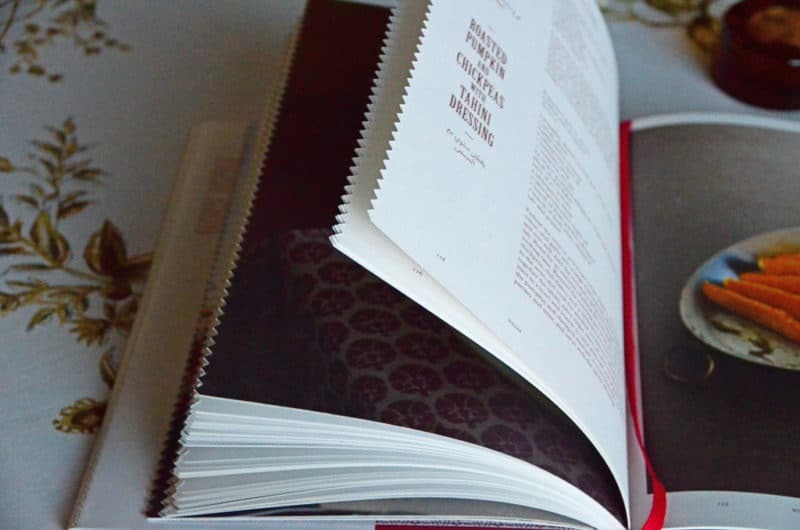 The book’s pages are edged in a zig-zag that your fingers want to run themselves over, and the red and green satin page-marker ribbons harken to a songbook at Mass. That’s fitting too, because this book does sing a song, a melody of Lebanon and its diaspora, the many millions of us who are, and are descendants of, the Lebanese who set sail with deep impetus for something else, something more, across one sea or another. Now here I am, and here we are, setting sail in one the best ways we know how—in the kitchen—with our own deep desires, in hopes of sailing back across. What a simple, unexpectedly delectable way to prepare winter squash! The combination of the sesame with the sweet squash is excellent. This is based on a recipe in Salma Hage’s The Lebanese Kitchen. The dish is also wonderful with slices of onion added to the roasting pan. Using a sharp chef’s knife, slice the squash in half lengthwise. Remove the seeds and pulp. Slice into wedges lengthwise. Peel the skin from each wedge using a sharp paring knife. Place the slices in a lovely baking dish. Drizzle with 4 tablespoons of olive oil and season with salt and pepper. Roast for about 30 minutes, or until the flesh is tender. In a small sauté pan, heat one tablespoon of olive oil over medium heat. Add the pine nuts and sauté until golden brown. Adjust the heat and watch closely as you go; pine nuts burn quickly. Salt the nuts liberally while they are still warm. In a small bowl, whisk one tablespoon of olive oil with the tahini, lemon juice, and garlic. 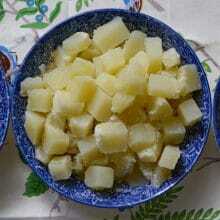 Add about 8 tablespoons of cold water, a few at a time, whisking until the sauce is pourable, but still has body. Season to taste with salt. 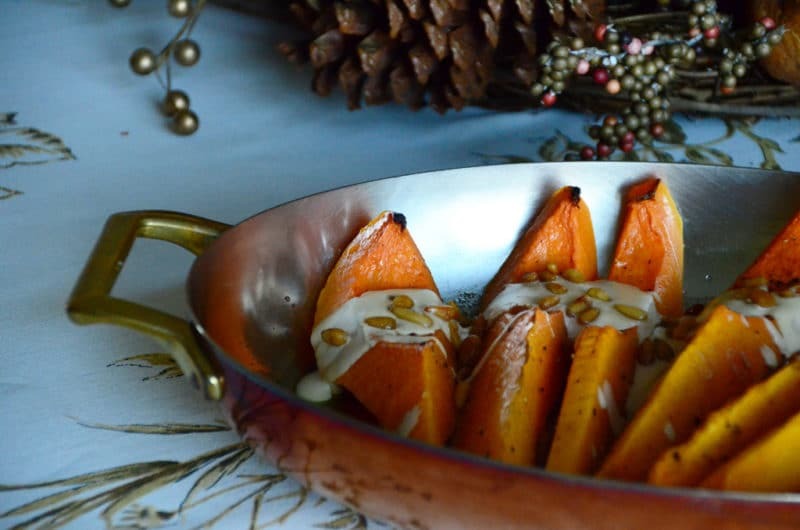 Drizzle the tahini sauce over the butternut squash and sprinkle with pine nuts. So good. Print this recipe here. 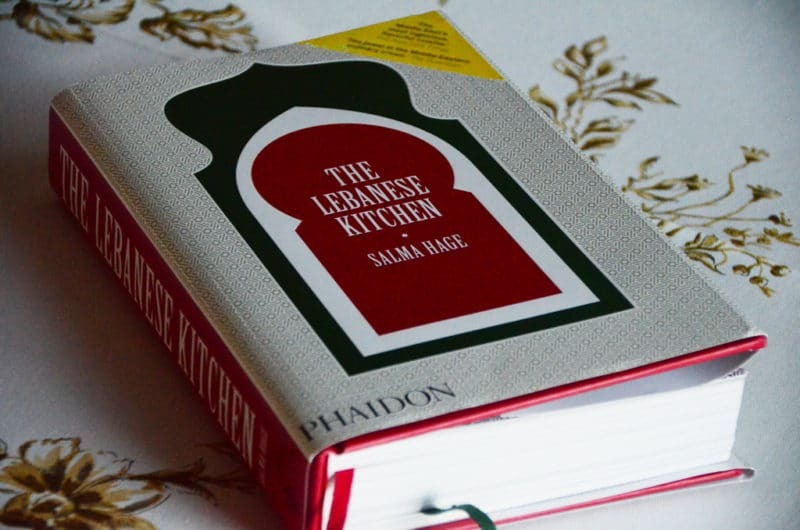 Buy Salma’s book, The Lebanese Kitchen, here. And learn more about author Salma Hage here. 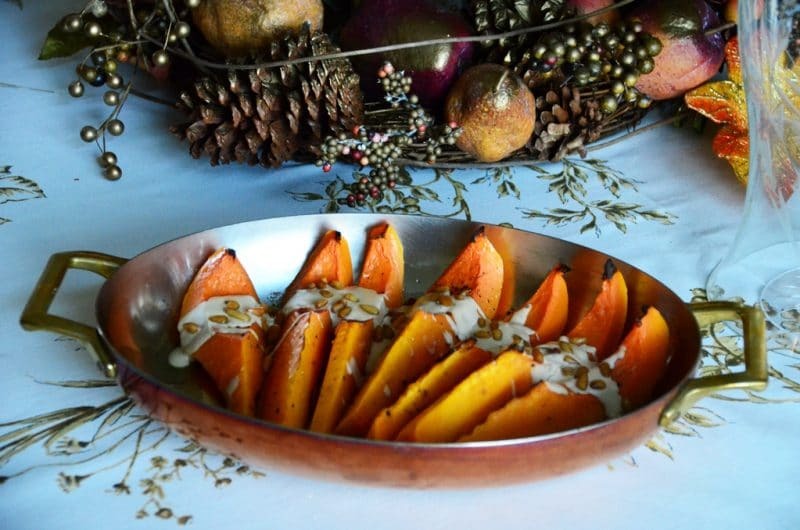 7 Responses to "Roasted Butternut Squash with Tahini and Pine Nuts"
Work that is light and more like play–what a treasure that is. That’s what I like about your blog, its implicit call to “come out and play!” And to see my own work as play. And, as usual, beautiful photographs that get the mouth watering. I was straining to think whether I have ever heard of butternut squash used in a Lebanese recipe. The closest thing that I could come up with was the pumpkin kibbee (Kibbee La’tene?) that my Aunts used to make during Lent. Other than that. 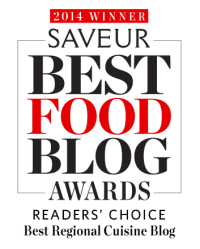 your recipe (by proxy) is likely the first! Can’t wait to give it a try as it is a perfect cross between my “Lebanese just got here” cooking and my wife’s “straight off the Mayflower” cooking. Maybe it will grace our Thanksgiving table alongside the hushwee and the English pudding! 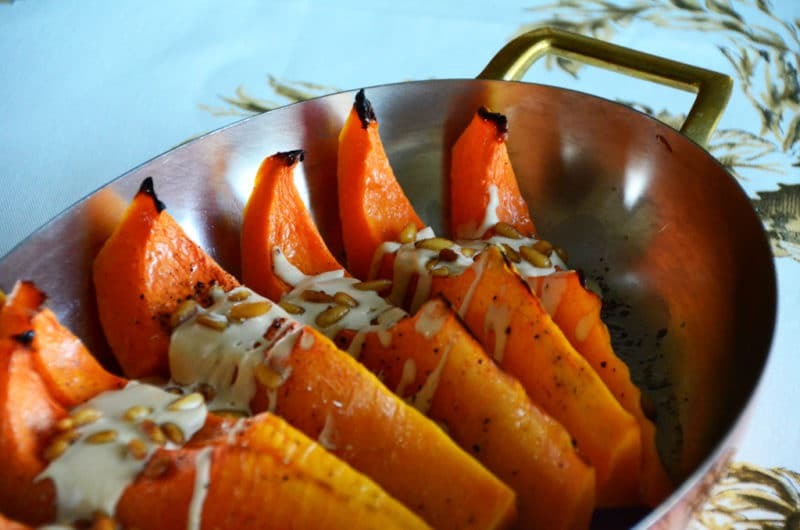 I love roasted butternut squash–just looking at your delectable picture brings back memories of my Mother’s artful cooking, and makes a beautiful start to the fall and all its glories and holidays. AND, I love your book–have purchased two copies thus far, one for my kitchen, which I have already used (made rushta sp? ), and one for my dear niece and her eldest son (aged 8) who loves to cook. Happy Fall, dear Maureen! You are a seven stars writer! I can imagine (can I?) how you cook. 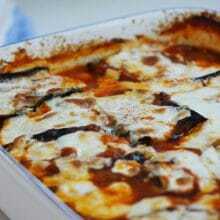 I made a dish similar to this just last night (and for lunch leftovers today) from the Jerusalem cookbook. Tahini dressing on roasted squash is just perfect. I love the stories that come with your recipes. It brings them to life. Wonderful!